It is so much fun to just do an event for fun. 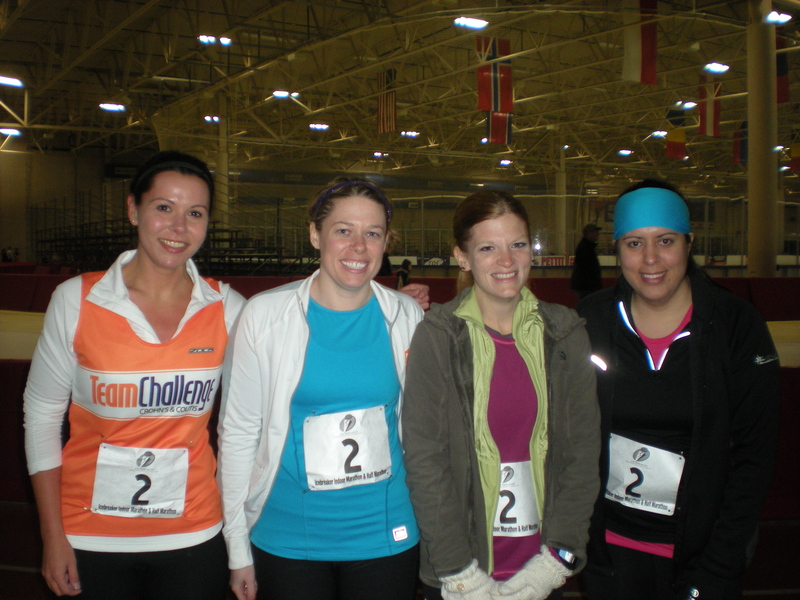 When I signed up for the Icebreaker Indoor Marathon Relay I didn’t really know what I was getting myself into, but assumed it would be fun. I was on Team Avoid the Lap. I have to credit the team name to Mandi. And for team bonding we watched A League of Their Own. We were very casual about this event, as in left most of the planning until race day. Goal: have fun. To make it an even more fun “race” weekend, Maureen came up to Milwaukee on Friday because she was running the half marathon Saturday morning. Like any good runners we decided to carb load the night before our races. And by carb loading I mean taking a tour of Lakefront Brewery. 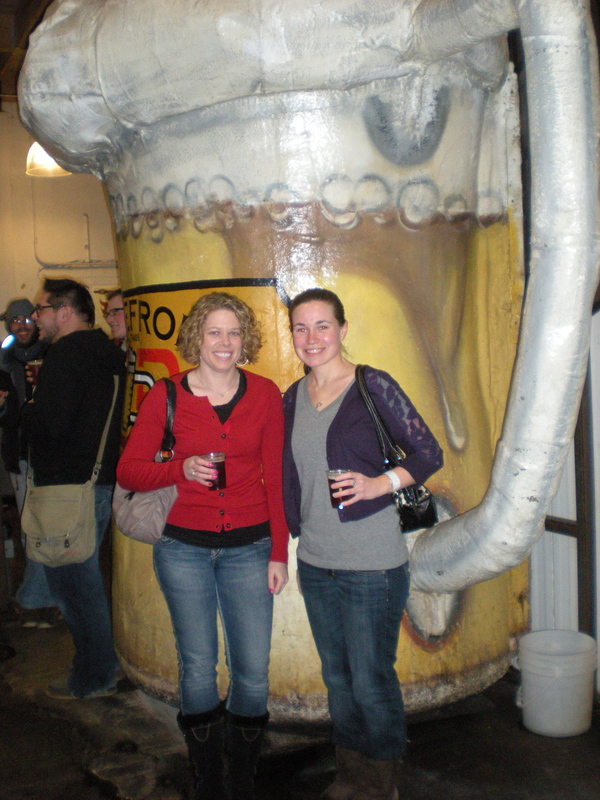 It is one of my favorite things to do when people visit Milwaukee plus Maureen likes beer. We followed up dinner with amazing cheeseburgers at Cafe Centraal, which of course included additional beer. We couldn’t go too crazy considering we had a 5:45 wakeup call to get Maureen over to the Petit Center for her Half. I ate some snacks and wore lots of layers while she ran. After the half we went back to my apartment for food and some rest. For her race recap check her blog over at iheartpikermis.blogspot.com. We picked up Sara and went back to the Petit, but this time in daylight. It wasn’t too hard to find our team because Fit Milwaukee had a tent set up. Being the ridiculously casual team that we were we still had to decide in what order we were going to run. Annie offered to go first, followed by Mandi, then Sara and I was the anchor. The whole event was lots of fun. We were situated with all of the other Fit Milwaukee teams so there was lots of cheering and people to chat with. The biggest downfall was that when you weren’t running you were standing on cement. Next year my yoga mat and/or a chair will be brought along. We broke up the marathon into 6 lap legs so we each ran 4 times. It was short enough I was able to really push it and recover before my next turn. I ended up running 6.4 miles in 49:41 which is a 7:45 pace! So fun to rediscover my speed. Maureen and I had grand plans of going out for beers after the race. Instead we ordered pizza, drank one beer, and passed out on my couches at 9:00pm. We’re awesome. It was a great weekend: I got to hang out with Maureen (we always have fun), I participated in a fun running event, and I snuck in an extra run on Sunday to finally run outside. Some of the kids who had been playing hockey (I assume) watched the end of the race from the bleachers. They had lots of fun yelling “Go Number 2!” every time I passed. WooHoo speedy! Sounds like a lot of fun, this is something I’ve been wanting to do, just haven’t! No shame in passing out by 9 after a day filled with fun and excitement. They are doing one in July now too, the Heatbreaker. Several heats of the half marathon and then a relay.